"Let us show you what we've got". I saw the new Camaro, and I think they were on the fence about making it, and I said "That's the car." Maybe that was suppose to be the 2014 refresh and not the 6th Gen... But what if it is??.. Remember GM let the cat out of the bag early with the 5th Gen in the original Transformers movie..but then these photos started surfacing of a Camaro in the same style of the upcoming movie.. I didn't read that whole article, but it could just as easily be talking about the TF1 car. GM has been impressively tight-lipped about the 6thgen. He's probably talking about the first movie. I think Bay is talking about the first Transformers movie in the quoted part. Haha.. Your photoshop is going around the net.. Good job!!! 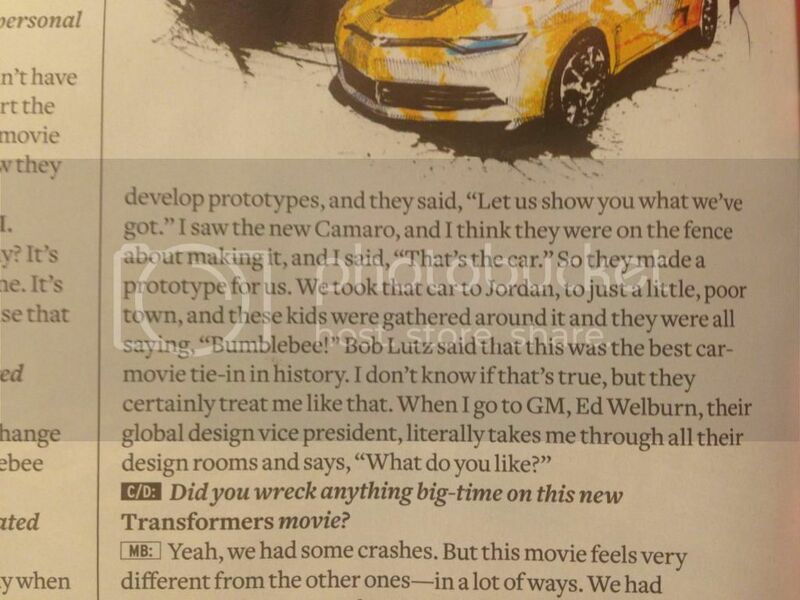 I wonder why a director would think he would have a say in the camaro development lol..
he's talking about Transformers 1. Bob Lutz isn't there showing him stuff now. I have read that before though. When they started development on TF1 it was still 2006, right around when the concept came out. So they showed him the cars they had, and the Camaro was just a concept still. The one in the movie had to be built for it. "bob lutz said that was the best car-movie tie in in history"
TF4 hasn't come out for that to happen yet. Totally agree that the 'new Camaro' he's talking about was the one in the first Transformers. BUT the part about Ed Welburn taking him through the design rooms and asking what he likes IS in the present tense. Put me in the camp that suspects that this TF4 car maybe, just maybe shares some design cues (e.g., the front grill and/or headlights) with the next Camaro. If he's going to help market a car by giving it a starring role in a movie that's seen by millions around the world and spun off into merchandising...ya I think he might have some influence there. Lutz is counsel to senior management, not VP now. This article suggests that Lutz has his old position at GM, not his present one. This is probably referring to the first film. Good job picking that blue !